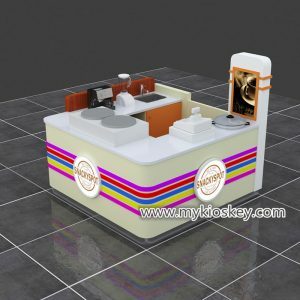 Fresh juice is popular among young people, that is very good ideas to open a fresh juice bar in mall, it is a kind leisure business, what’s more also can help you make much money, for the first time to make this business , you maybe consider save invests cost, so today I want to introduce how to save costs for open a fresh juice bar . First, if want saves costs, most important rent a small location so that you can pay less rent. 1. 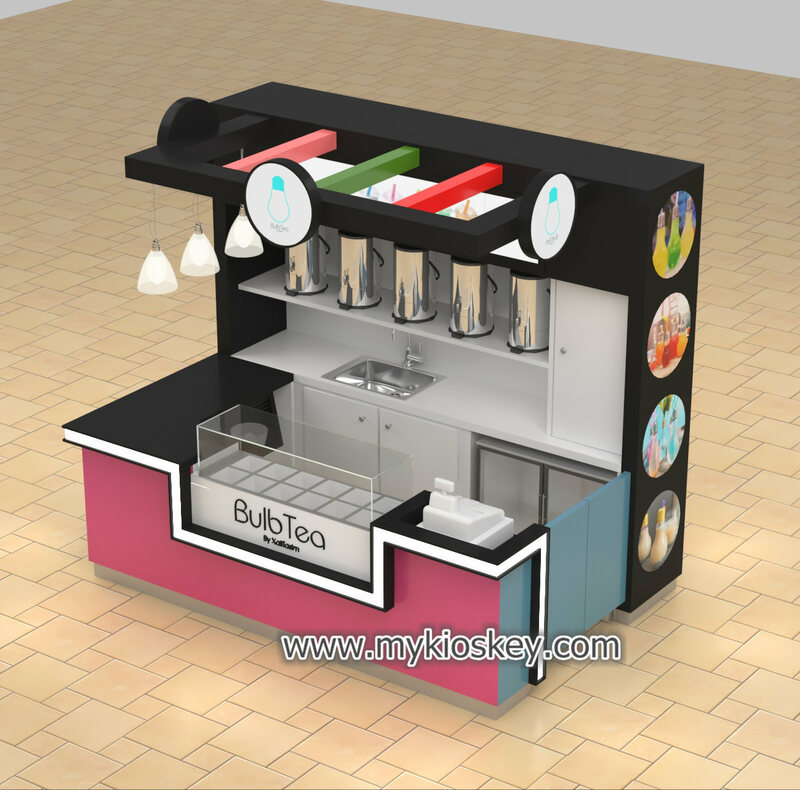 First kiosk design, try no use with roof design, because any display kiosk with a roof, cost all is high because roof has a high technical requirement, craft complex, install cost high, of course, if you have to choose roof, can consider simple. 2. 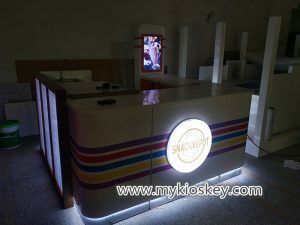 Design shape, want to save fresh juice bar costs, trying to use boxy shape. 3. Materials choose, modern and lower costs, suggest you use baking painting, baking painting finished effect is very high-end in mall, what’s more cost also is lower than the laminate surface. 4. Try to less logo on the kiosk, in general one set kiosk 2-3sets logo already is enough, if more logo show our kiosk more fancy, look like not so elegant. 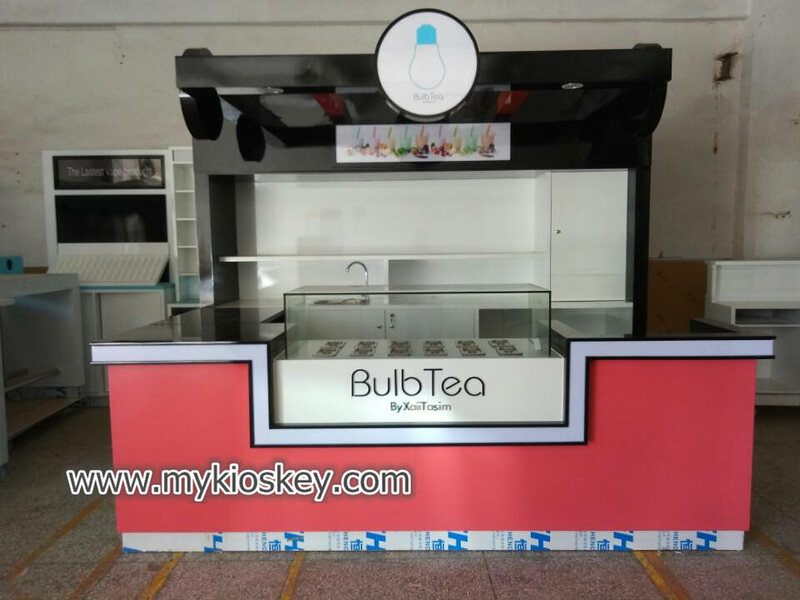 Below are some real project photos for fresh juice bar, these size about is 3*2m, 2*2m, or 3*3m, estimate cost is about 5000-6000usd. There are also some customers estimate about 3000usd, 4000usd, honestly, this estimate is a little lower, but suggest can consider making a cart in mall, we are real factory and will provide you a cheaper and competitive price, if you are interested in opening fresh juice bar, welcome inquiry.